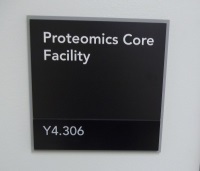 Location & Hours The Proteomics Core is located in rooms Y4.306 (Lab) and Y4.310 (Office) of the Green Biomedical Research (Y) Building. The core receives samples Mon-Fri 9am-5pm. Appointments to discuss submissions or samples are available Mon 10am-12noon and Wed 2pm-4pm. Contact the core to arrange an appointment. Inquiry System We use an inquiry ticket system to ensure that all relevant core staff can access and respond to queries, and that inquires are answered promptly even if an individual member of staff is unavailable. Please send an email ProteomicsCore@UTSouthwestern.edu with as much detail as possible about your inquiry. Telephone Tel: (214)-648-3525 Please use the inquiry ticket system / email address above in for inquiries in the first instance.